During the webinar you'll learn how to apply real insights to your Facebook marketing efforts and get ahead of the curve. Justin Kistner will offer detailed data-driven explanations about the value of utilizing Facebook for your marketing campaigns along with tips, tricks and inspirational ideas. Today’s customer journey has changed significantly. As a consumer you’ve already made the shift, but how is this new consumer behavior affecting your organization and marketing tactics? You’re not so different from your audience. Join Altimeter Group and Webtrends for a new webinar about today's dynamic customer journey. After the adrenaline rush from hitting your fan growth goal subsides, the harsh reality of "Now what?" takes over. Management starts asking about how you plan to monetize your fan base. They want to know what the return on investment is for all of your new found fans. If you're like most, you turn to the wall in a desperate attempt to publish offers only to be disappointed by the results (we'll talk more about why this happens on the webinar, but it's because transactional content gets low engagement, which means Facebook's EdgeRank algorithm filters those posts out of the stream). What you need are ads for fans. Did you know you can target your fans with ads just for them? And did you know they get an average of 7X higher click through rate; which not only means a higher response, but also makes them a much cheaper cost per click? Join us for this in-depth session on the least understood best practice in Facebook advertising and start delivering real business value from social campaigns. Page admins all want to know a few things: What should I be posting on our wall? When should I post? How often should I post? How do I know if the posts I published performed well? To help answer those questions, Facebook recently released more post-level data. Webtrends was one of seven companies that was allowed early access to this data before it was publicly released, which lead to the development of Hoverstats. Hoverstats is a browser plugin that takes your Facebook data and overlays it directly on your Facebook page. It's core feature is the patent pending PSI, post score indicator, which calculates a score for each post from 0-100 based on a post's performance. Using PSI, page admins can easily compare their past posts using a single number to more easily see which posts are stars and which are duds. Justin Kistner will demo Hoverstats and PSI as well as share the insights that have surfaced from seeing countless scored posts. 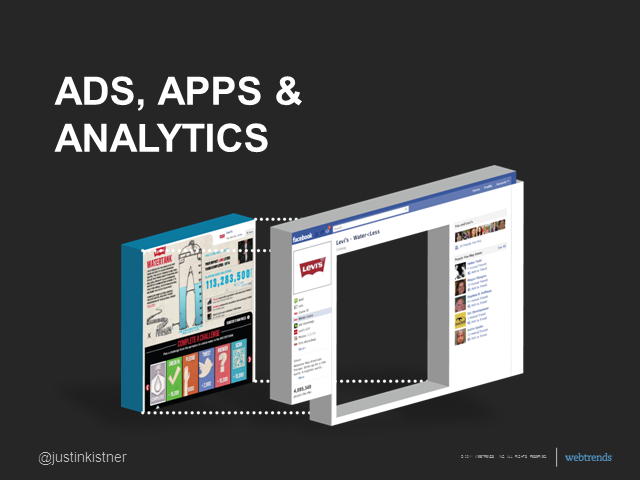 Providing performance base marketing insights for Social and Facebook campaigns.